The Doug and Maria DeVos Faculty Summer Support Award in Global Supply Chain Management has generously awarded $25,000 to Krannert faculty each year in support for research with themes revolving around Global Supply Chain Management, conducted over the summer academic break. This important sponsorship has been funded since 2005 and has benefited a diverse set of faculty from across the Krannert School of Management. Without these vital funds, chosen faculty would have been unable to carry out their important mission of looking at Global Supply Chain Management thorough a rigorous academic lens, innovating new approaches and applying fresh solutions. Each year, the research style has varied from theory development to empirical research based on primary or secondary data sets. While the primary purpose of the research funding was aimed at enabling faculty to pursue their research agenda, which complements the GSCMI’s mission, additional incentive has been provided to researchers willing to broadly communicate the results of their summer work to DCMME/GSCMI center partners through the annual Fall Operations Conference. The summary of researchers and their DeVos Research overviews that follow are a tribute not only to the academic capability that can be found at the Krannert School of Management, but also to the entire DeVos family, for which this work is dedicated. We are proud to have been the guardians of the DeVos Faculty Summer Support Award in Global Supply Chain Management for its 7-year term (2005-2012), and are equally proud of the strong works that were born due to the DeVos’s family leadership in promoting research in the field of Global Supply Chain Management studies. Qi Annabelle Feng is an associate professor at the Krannert School of Management, Purdue University. Before joining Purdue, she taught at McCombs School of Business, The University of Texas at Austin. She received her Ph.D. in Operations Management from UT Dallas in 2006 and her undergraduate degree from Shanghai Jiao Tong University in 1999. Her main research interest lies in studying firms’ sourcing decisions in the broad context of supply chain management. Her work focuses on individual firm’s procurement planning in uncertain environment and multiple firms’ interactions in sourcing relationships. Her papers on these topics have appeared in many journals such as Management Science, Manufacturing and Service Operations Management, Operations Research and Production and Operations Management. Feng is a Senior Editor for Production and Operations Management. She received the first prize in the INFORMS Junior Faculty Paper Competition in 2009 and the Wickham Skinner Early-Career Research Accompaniment Award in 2012. Her work on product proliferation with HP won the 2009 Edelman Award sponsored by INFORMS. The main focus of this proposal is to investigate consumer behavior may be shaped and other activities within the supply chain may be coordinated in order to achieve higher profits. There is little prior work addressing this issue. The proposed research is not only interesting from an academic standpoint but also from the perspective of the industry. The company, with whom we are currently working, has agreed to experimentally validate some of the results. They may even subsequently adopt the implementations we propose. More broadly, our insights are expected to be relevant even to other supply chain scenarios where there is an opportunity for companies to coordinate their consumer behavior shaping activities with other activities in the supply chain. These opportunities are increasingly since the Internet channel is becoming integral part of the supply chain in a increasing number of companies. Professor Kannan’s current research focuses on markets and pricing of information goods/services through auctions, and economics of information security. His papers have been accepted in several leading conferences and journals in the information systems area, including Management Science, Information Systems Research, Workshop on Information Technology and Systems, Workshop on Information Systems Economics, International Conference on Information Systems, and Conference on Information System and Technology. His papers have won the Best Paper Awards in the 10th and the 15th Annual Workshop on Information Technology and Systems. He currently serves as an Associate Editor for Management Science, Information Systems Research, and MIS Quarterly. He is a member of AIS and INFORMS. He is also a CERIAS Fellow and Krannert's Faculty Fellow. A report he prepared with his colleagues, Professors Jackie Rees and Eugene H. Spafford, for McAfee Inc. received media coverage (e.g., CNET, Bloomberg) and, with respect to that report, he is quoted in Forbes. Professor Kannan's teaching interests include database management, electronic commerce and telecommunication. He typically teaches the core MIS course in both the undergraduate and the graduate programs at Krannert. He has also been recognized as a distinguished teacher in the MBA program. Private nonprofit organizations (NPOs) and governmental agencies are the mainstay of healthcare provision in low-income countries. These organizations are funded by international donors that try to efficiently allocate aid between a portfolio of recipient entities based on some performance metrics. Subsequently, NPOs and governments adjust their supply chains to improve their performance along the metrics set by the donors, so as to maximize their assigned funds. Nonetheless, a bad selection of metrics might jeopardize good supply chain practices that trigger operational efficiency. The purpose of our study is to improve the efficiency of healthcare nonprofit supply chains by suggesting performance metrics that improve allocative and operational efficiency. We also seek to advise those organizations that are not on the efficient frontier on how to improve their performance by adjusting their supply chains. Gemma Berenguer is an assistant professor at Krannert School of Management, Purdue University. She received her Ph.D. Degree from the University of California at Berkeley before joining Purdue. Her research interests include integrated supply chain design problems, nonprofit and health care supply chain management, and the design of regulatory mechanisms for environmental policies. Professor Berenguer teaches operations management and sustainable and socially responsible operations in the undergraduate and MBA programs. She is a member of INFORMS, POMS and MSOM. The Supplier Diversity Study at Purdue sought to develop tangible quantitative and qualitative metrics associated with supplier diversity initiatives within academic institutions, for the purpose of evaluating the financial business case to support supplier diversity at the institutional level. 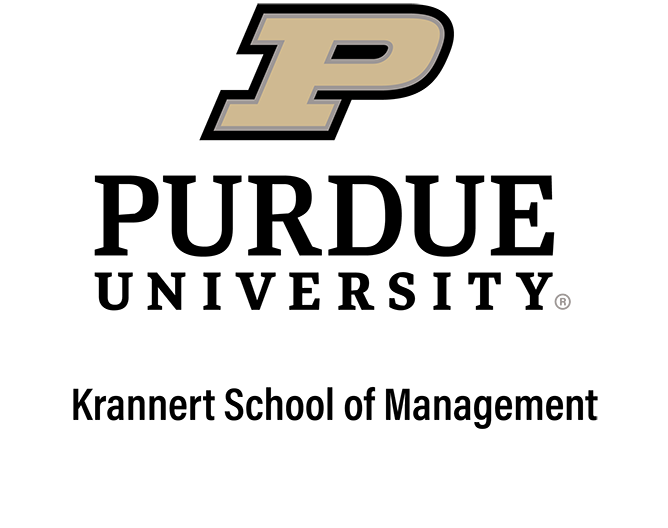 The project evaluated Purdue University’s utilization of women and minority owned businesses relative to the university’s entire procurement spending. Extensive research was completed for this task, including creating an extensive database for all the FY 2011 competitive bids and sole sourced contracts, while considering multiple stakeholder interviews, and benchmarking with corporations. The analysis of the data concluded that increased competition and access to minority and women owned businesses can improve spend efficiency, while simultaneously creating a supply base that reflects the diversity of both internal associates and external customers. The 2010 proposed research will study the evolution of global supply chain complexity at industrial and economy-wide levels. Dr. Hummels will examine how the extent and growth of that complexity is a response to the competing imperatives of comparative advantage and diversification, and also examine whether highly interconnected global supply chains dampen or heighten the international transmission of business cycle shocks. Professor Hummels’ teaching interest is in international economics. His research focuses on empirical investigations in international trade, with a special emphasis on product differentiation, barriers to trade, and the effects of transportation and infrastructure on trade and economic development. Dr. Hummels is a two-time DeVos Research Award recipient, receiving his first award in 2006 for the research topic of Valuing Timeliness in Global Supply Chains. Professor Deshpande teaches operations management. His research interests are in the areas of supply chain coordination, service parts management, and contingency logistics systems. His other topics of study include military applications and inventory models. His current research papers include “A Threshold Rationing Policy for Service Differentiated Demand Classes,” Management Science; “Incentive Compatible Pricing Mechanisms for Service Differentiated Supply Chains,” and “An Empirical Study of Service Differentiation for Weapon System Service Parts.” Professor Deshpande is a member of INFORMS and M&SOM. He is also a member of honor societies Tau Beta Pi and Alpha Pi Mu. He has refereed research papers for journals including Management Science, EJOR, and IIE Transactions. Professor Deshpande completed his Ph.D. at the Wharton School, University of Pennsylvania in 2000. As a part of his Ph.D., he was involved in an extensive supply chain coordination project with the U.S. Navy and the Defense Logistics Agency. He has also worked as a financial engineer at the Bank of Nova Scotia, N.Y. He is currently working on a research project funded by NSF on “Contingency Logistics Systems” along with Professors Iyer and Thomas. Professor Tang joined the Krannert faculty in 2006. Her areas of interest include information systems, electronic commerce, telecommunication and network management, database management, IS strategy, and system analysis and design. She received a William Larimer Mellon Fellowship at Carnegie Mellon, and a Graduate School Fellowship and Summer Fellowship at Boston College. Professor Bisi’s teaching interests include statistics, management science, stochastic modeling, multivariate analysis, and forecasting. His current research focuses on inventory control, stochastic modeling, supply chain management, and production planning. His current publications include “The Censored Newsvendor and the Optimal Acquisition of Information” with Martin L. Puterman and Xiaomei Ding, Operations Research, (2002); “Average Cost Optimality for an Unreliable Two-Machine Flowshop with Limited Internal Buffer” with Ernst Presman, Suresh P. Sethi and Hanquin Zhang, Annals of Operations Research, (2000); and “Stability of Degenerate Diffusions with State-Dependent Switching” with Gopal K. Basak and Mrinal K. Ghosh, Journal of Mathematical Analysis and Applications, (1999). Prior to Krannert, Professor Bisi was a visiting assistant professor of management science at the A. Gary Anderson Graduate School of Management, University of California (2001-02). He received the COE-MITACS Postdoctoral Fellowship from the University of British Columbia, Vancouver, Canada (19992001). He is a member of INFORMS and MSOM. Yu (Jeffrey) Hu is an assistant professor at Purdue University’s Krannert School of Management. His research studies how Internet markets differ from traditional markets and how businesses should adapt their strategies in response to the unique characteristics of Internet markets. He has also written papers that study Internet advertising, pricing of information goods, and privacy protection regimes on the Internet. His research has been published in leading journals such as Management Science, Sloan Management Review, Journal of Management Information Systems, and Economic Inquiry. His research on the "Long Tail" phenomenon on the Internet has been discussed extensively and cited by media outlets such as New York Times, InformationWeek, Wired Magazine, TIME Magazine, and INC. Magazine. He has conducted research for a number of companies including Amazon, HP, and several Internet retailing companies. He recently won a Willis Young Faculty Scholar Award at Krannert School of Management. Dr. Hu received his Ph.D. in Management Science and Information Technology from MIT’s Sloan School of Management. Prior to coming to Purdue University, he worked for MIT’s Center for Digital Business. He received a B.S. degree in Finance with the honor of Outstanding Graduating Student from Tsinghua University, Beijing, China, and received a M.S. degree in Economics from University of Wisconsin-Madison. Dr. Hu teaches an MBA course--Digital Business and Information Strategies (MGMT 590S) and an undergraduate course--Electronic Commerce and Information Strategies (MGMT 488) at Krannert School of Management.